The 75m2 vacation house consists of a living-dining area,two bedrooms,kitchen ,bathroom and a shady veranda,is ideal for couples and family vacations.It lies in a 2500m fenced property surrounded by a beautiful garden, along with a similar vacation villa which hosts the owner during weekends and summer vacations.Merely 200m from a sandy beach, accessed through a footpath ,it can host up to 5 guests. Live in Thessaloniki,amateur musician playing guitar. Sithonia,the 2nd peninsula of Halkidiki region is one of the most beautiful places in Greece,with the green going all the way down to the perfect beaches. Beatiful garden with some mature olive trees and lawn. Guests can dine inside in the living - dining area or outside at the veranda . Golf terrain at 20km distance. More than a vacation...a true experience! My family and I (my husband and 1 year old boy) stayed at this lovely home in June 2016. I have to say it was one of the greatest vacation we ever had! You hear about Greek hospitality but these people really live and breathe it. Dimitris and his wife Mary were such great hosts! They made sure that we were comfortable and had just about anything we needed. They welcome us with a basket with local products and provided us with great tips for the best beaches and places to visit around. The house was lovely! You can really tell that it was made with love and great attention to detail. It was spacious, clean and very comfortable. The terrace – surrounded by flowers – was a fantastic place to relax in the afternoon or at night and the garden is just great; green and big, ideal for a kid to run around. The place is quiet but also close to many great stuff, although you’ll need a car. All in all, it was really much more than a vacation for us...it was a true experience. Definitely will be going back! Wir haben uns eine Woche lang super wohl gefühlt. Das Haus ist sehr geschmackvoll und mit viel Liebe eingerichtet. Das Grundstück mit viel Platz bietet Erholung pur. Dimitris und seine Frau sind gaanz nette Gastgeber. Wir haben uns super verstanden und gern den einen oder anderen Abend bei hausgemachter Musik miteinander verbracht. Die Lage des Objektes ist ebenfalls klasse. Kurze Wege führen einen ans Meer oder auch zu den anderen Fingern von Halkidiki. Selbst ein Abstecher nach Thessanloniki wäre durchaus machbar, wobei man sich allerdings kaum von den traumhaften Buchten Sithonias entfernen möchte. Oktober ist eine super Reisezeit: es sind nur noch wenige Urlauber unterwegs, man hat die Bucht und das traumhafte Wasser für sich allein. .Excellent guests! Any host would be lucky to have them! They were friendly, punctual, communicative and very tidy. They respected our place and I would be very pleased to host them again. I wish them all the best and a life full of travel and music!! Dimitris is a very nice and friendly host. The Appartment was perfect for us. The children played a lot in the wonderful garden. Hope we can come back soon ! it was a pleasure to host you!! you are very welcome to host you again in the future! 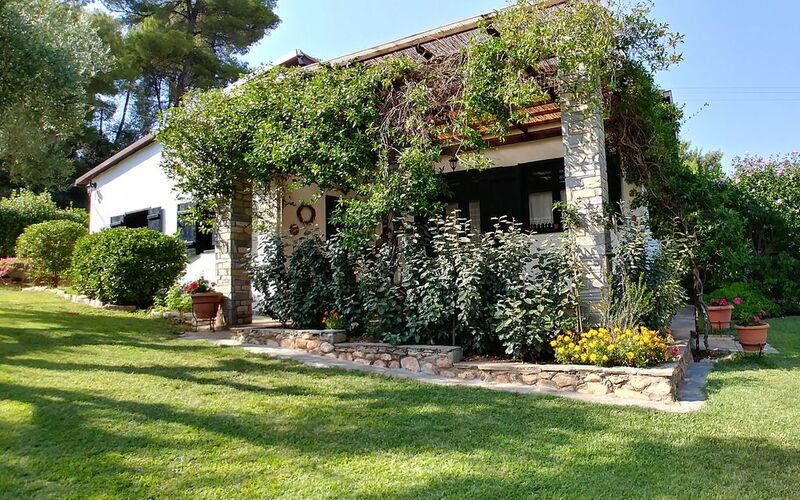 Our house is located at the entrance of Sithonia peninsula,1,5 km from Metamorfosis village and 5km from Nikiti town.This is a strategic point for exploring the beauties of Sithonia;don't forget to visit Nikiti old village,up on the hill of Saint Nikitas with old stone houses.